Therefore the People of the United States of America shall recommit to the development of the science, technology, and equipment, necessary to solve the world’s energy needs as set forth by the United States Department of Energy 2001 final report “Realizing the Promise of Fusion Energy,” through the direct conversion of matter to energy in accordance with the undisputable laws of physics as set forth in the relationship of matter and energy defined in the formula E=MC² by a successful demonstration before the end of the next decade. Fusion is the ultimate source of energy for human civilization in every sense of the word. Fusion transforms mass directly to energy according to Einstein’s formula of “special relativity” (E=MC².) A very small amount of fusion fuel creates a very large amount of energy. 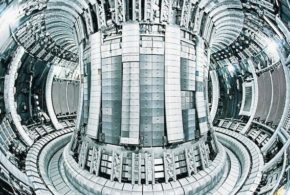 The cost of fusion fuel (hydrogen-deuterium and lithium) per mega Watt hour of energy is so close to zero that virtually all the cost of electricity generated from fusion arises from the capital cost of the power plant and the amortization of development, operating and maintenance costs. The profit potential of fusion power is immense. Fusion can be used to create synthetic liquid and gas fuels for the transportation industry, thereby replacing petroleum and natural gas, as well as virtually unlimited electricity. Direct fusion propulsion has long been considered by NASA for the next generation of manned spacecraft for travel to Mars and beyond. Fusion power is environmentally clean, emits no greenhouse gases, and produces no appreciable radioactive waste. The planet’s fossil fuel reserves are severely limited. Whereas current nuclear fission fuel resources from Uranium and Thorium are relatively abundant, nuclear power has safety, radioactive waste, and weapon proliferation issues. 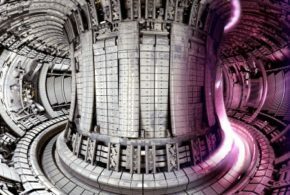 Fusion power is the only known hope for mankind’s survival on this planet based on projected worldwide population levels in the foreseeable future. If all peoples of the world are to live comfortable lives and have the ability to prosper, we must increase total worldwide annual energy production by a factor greater than ten times current production. That is not possible with today’s energy sources and if it were it would deplete fossil fuel reserves well before the middle of this century. “Alternative green and renewable” energy sources can supply less than 4% of projected 2050 total energy requirements. There is only one way to produce this amount of energy to support mankind. 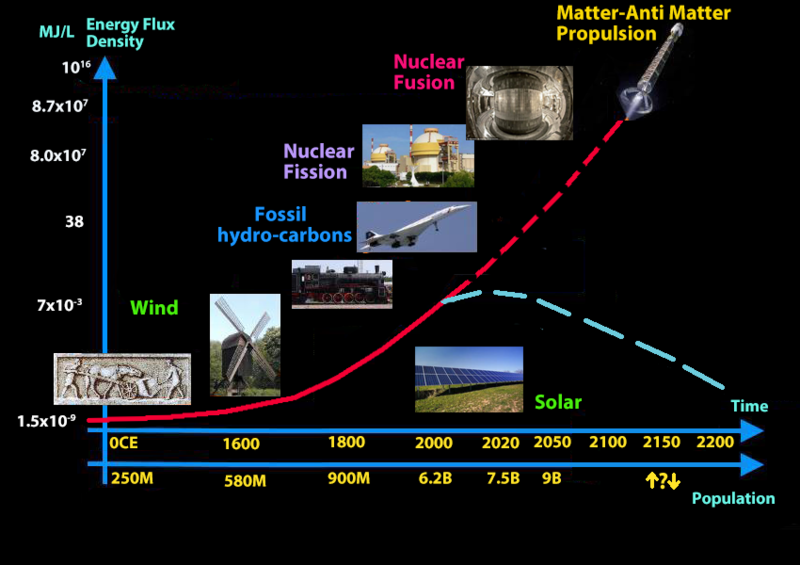 That is the conversion of mass into energy through the process of fusion power. The fundamental ingredient required to support mankind is energy. 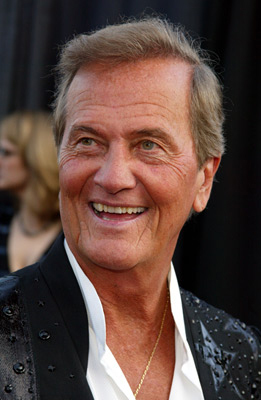 If all nations are to enjoy a decent standard of living, they will require energy resources in amounts approaching those consumed in the United States and the west in ratio to their populations. 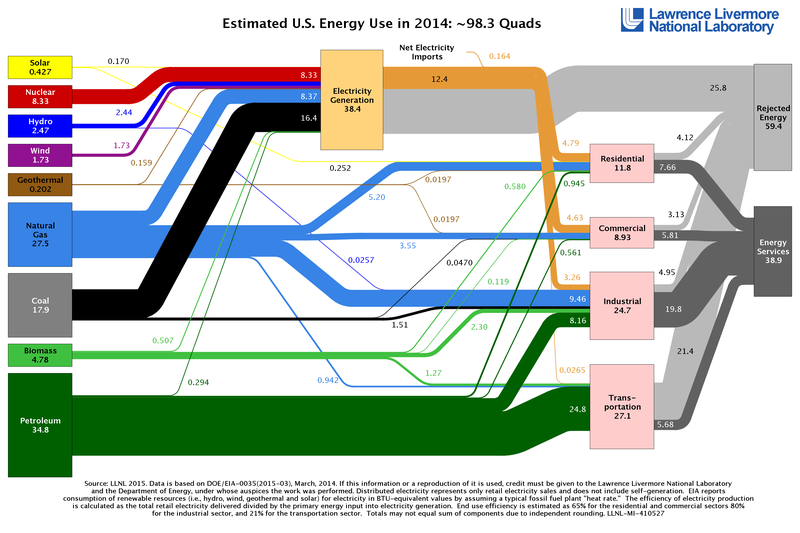 Today the population of the United States is approximately 310,000,000 or close to 4.5% of the world population, yet the United States consumes over 25% of world energy use. To support our current world population at a standard of living approaching that of the United States, we would have to increase world energy production by well over 10 times. Given the fact that energy production from fossil fuels has peaked in terms of economically recoverable capacity, and liquid, gas and solid fossil fuels will be depleted within 75 years, a new much higher flux density source of energy must be found. There is only one known and realistic source. To reiterate, that is the direct conversion of mass into energy based on Albert Einstein’s formula describing “special relativity” and the equivalency of mass and energy represented by the formula E=MC². This law teaches us that a very small amount of matter has the energy equivalent of a very large amount of energy when converted. Fusion is the process that powers the Sun and the stars. It is Nature’s way of creating energy and is the opposite of atomic fission, the process by which nuclear power is produced today. In fusion, the atomic nuclei of two light atoms fuse to form heavier nuclei. In the process, a large amount of energy is produced due to the conversion of mass directly to energy as expressed by the formula E=MC². For commercial production of fusion energy, the fusion reactions considered in the short term involve the two isotopes of hydrogen, namely 2H or deuterium (D) and 3H or tritium (T.) Deuterium exists naturally in sea water which is a plentiful source of the isotope. When deuterium and tritium are chosen as the fuel for a fusion power reactor, tritium is produced as part of a carefully designed fuel cycle involving the very common element Lithium. The nucleus of a deuterium atom contains a proton and a neutron, whereas the nucleus of a tritium contains one proton and two neutrons. When a deuterium nucleus fuses with a tritium nucleus, a helium nucleus is formed with the release of one neutron. Both the helium nucleus and the neutron carry the energy produced by the fusion reaction. When one gram of deuterium completely fuses with one and a half grams of tritium, 235,852 kilowatt-hours of energy is produced. At a price of 5 cents per kWh, this energy is potentially worth $11,790, less generation costs. In order to produce fusion energy reactions, a deuterium-tritium (D-T) mixture must be heated to a temperature well above 100 million degrees Celsius in order for the fusion reactions to occur at a significant rate. At such temperatures, the orbiting electrons about the nuclei of the atoms of the D-T mixture are liberated from the electrical attraction of the nuclei which then become positively charged ions, and the mixture of electrons and ions is called a “plasma.” When a magnetic field is applied to the plasma, the charged particles in the plasma gyrate in circles about the magnetic field lines, preventing their loss from the magnetic field. Thus, a magnetic field can be used to confine a plasma at very high temperatures keeping them away from any material wall. This is the basic principle of one approach to fusion energy and is called magnetic confinement fusion (MCF). 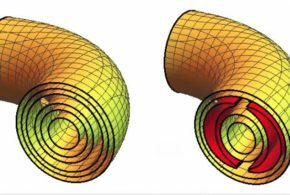 However, in practice, the plasma particles collide and may drift across the field lines and get lost from the magnetic field over a sufficiently long time interval, breaking the magnetic confinement of the plasma. This is a R&D challenge to overcome. 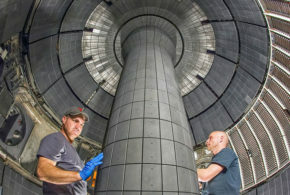 Another approach to “confining” a hot plasma is to make use of the fact that no matter how hot a gas is, it takes time for the gas to expand and cool because of its own inertia (mass). This is the basic principle of another approach to fusion energy called inertial confinement fusion (ICF). In this approach, a D-T mixture is compressed by some means such as a blast of high power laser beams, which is called the driver, to fusion temperatures and to a very small volume; usually no larger than 0.1 mm in radius, located at some distance from the chamber wall. The fusion reactions occur in this very tiny but very dense ball of plasma for less than a nanosecond. The plasma ball expands and cools and the fusion reactions cease. The process is then repeated like an internal combustion engine in order to produce a continuous stream of energy pulses equivalent to an average continuous power. The difference between nuclear fusion and conventional nuclear fission is that nuclear fission is accompanied by large amounts of radioactive waste products that have long half-lives of tens of thousands of years, whereas fusion proper produces no direct radioactive waste products. However, it is anticipated that the very early fusion DT reactors will produce some indirect radioactive products with half-lives of only a few years. Thus, commercial fusion power will not create a nuclear waste problem. Furthermore, in order to maintain the fusion reactions in a reactor, input power is required. In the event of an accident causing malfunction, the input power will be lost and the fusion reactions stop in the reactor. 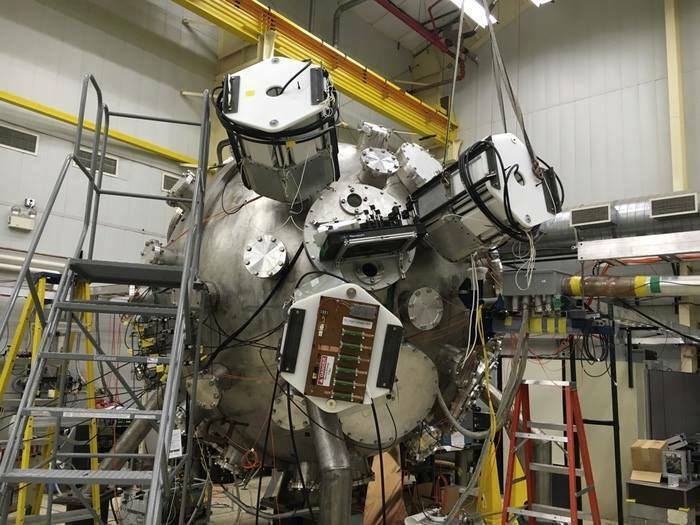 In this sense, a commercial fusion power reactor is fail-safe because it does not have a run-away core melt-down problem as might occur in a commercial fission reactor during an accident or reactor malfunction. In summary, fusion is safe and clean. The fuel cost is near zero. There is enough of it to last the human civilization for millions of years. It is Nature’s own way of producing energy in the Sun and in the stars. We know absolutely for a fact that it works because it has been produced by humans in thermonuclear tests. 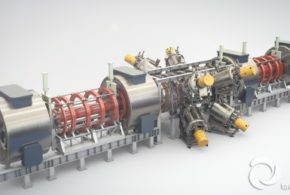 What remains to be done is to engineer a solution to generate fusion energy in a commercial power plant at a sufficiently low operating cost in order to produce electricity, as well as liquid synthetic fuels for aircraft and the like. That is the Challenge by the American people for which the whole world is willing to pay for generations to come.